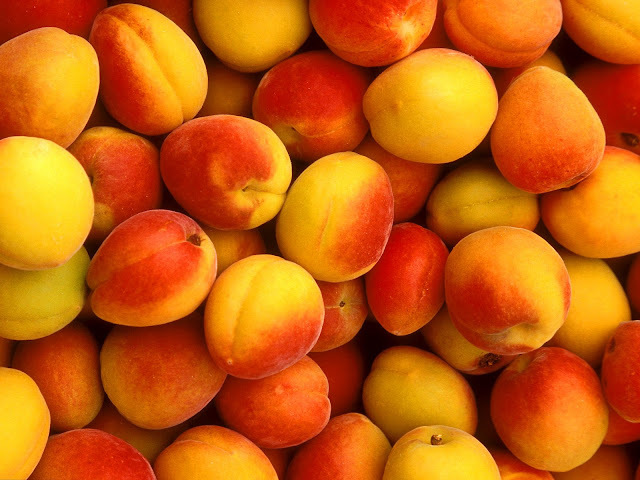 This is my favorite time of year: peaches are abundant. So many types, sizes, colors. But nothing beats a Georgia peach for sweetness an texture. I like a little bit of a twist on classic peach cobbler - it's just sometimes called for! Kick it up a bit, make it a little better, whatever works, just do it (with all due respect to Nike.) This recipe I adapted from Paula Deen the Butter Queen. I reduced the amount of butter and sugar and added a little kick with Chipotle powder and cinnamon in the peaches as they cook and added cinnamon and ground ginger to the batter. I also opted to put in a pint of fresh, beautiful raspberries. Tart. Textural. Delicious. The aroma as it cooks is unbelievable. Preheat oven to 350 degrees F. Combine the peaches, 1/2 cup light brown sugar, and water in a saucepan with 1 tablespoon cinnamon and the Chipotle. Bring to a boil and simmer for 5 minutes. Remove from the heat. Put the butter in a 3-quart baking dish and place in oven to melt. I use a covered casserole because it makes it easier to store when finished. You can also opt to do the batter on top (as I did in a previous post). Just do what makes you happy. this crust is very "cakelike". I like to turn all the fruit mixture and then serve. To serve, scoop into a bowl and serve with your choice of toppings, or go completely naked and enjoy it as is. You can also add a pint of any type of fresh berries when you spoon the peaches into the batter and it really turns out equally well each time. ENJOY!